Whilst undertaking an archaeological survey in the area around the northern Ethiopian town of Aksum in late 1995 I spotted what appeared to be an obvious short cut on our map. Suggesting to my Ethiopian colleague that we could take this route, he dismissed me with the statement: “we cannot go through that village. They are all Buda there.” What, I asked, was the Buda? The answer came back that these people were variously mad, dangerous, strange, outcast and had the power of the evil eye; they would be liable to curse us. This was not the first time that I had come across such a belief; it was well known in the town itself that many of the artisans engaged in metalworking possessed the power of the evil eye, and walking past green pea fields, what I had mistaken to be simple scarecrows (pieces of rag and plastic tied to poles) actually turned out to be amulets protecting the crop from those with the power to blast it. The more you look beneath the veneer of the Ethiopian Orthodox Church, the more apparent it becomes that Ethiopia is rich in folk belief and superstition. This contribution is the result of a number of years’ research and first-hand experience within Ethiopia of notions surrounding the evil eye–especially in relation to the power of the blacksmith or artisan. We will consider the dynamics of Ethiopian evil eye belief set against the widely recognised and rich magical symbolism associated with iron working in Africa; this symbolism and the magical powers that iron working artisans possess, it seems, may have a common and much more universal foundation. It is clear that there are globally a number of interlinked themes associated with the evil eye belief. The ability to cast the spell by the eye is usually associated with certain distinct groups of people, often based on gender or kinship links. In some cases the possessors of the evil eye may not actually know that they have the power to cause harm. In Ethiopia, for instance, it is low caste peoples who may transmit this power, in Iran it is kin-based, whereas in ancient Israel it was traditionally a spell associated solely with the priesthood. There is no doubt that the symbolism of the “look” carries connotations of envy (Gravel 1995, 7), or perhaps harks back to the Ten Commandments and the idea of “coveting” (Roberts 1976). From an anthropological perspective, recent research has emphasised the roots of this belief in the breakdown of patron and client relationships; the downtrodden-frequently artisans–being envious of the wealth and possessions of their social superiors whom they serve. It is the social superiors who may create and perpetuate this myth of the evil eye, often, it is argued, as a means of social control (for example, Galt 1987), turning groups of artisans into untouchable pariahs. The actual spell itself, which may be no more than a covetous glance or a statement praising somebody or something, may have a number of unpleasant side effects. The following have been variously reported by my Ethiopian informants of being symptoms of being struck by an evil eye spell: wasting sickness, domestic accidents, infertility, plain bad luck, sick livestock and blighted crops. In common with elsewhere in the world, these spells may in many cases be combated by the use of counter-magic, such as invocations, exorcism, charms and amulets (Gravel 1995, 11). 1. Such artisans are usually landless, a separate caste apart from the mainstream, and being peripatetic craftsmen are often seen as strangers and are regarded with distrust and often downright disdain. Because they possess little materially (cf. Gait 1987), they are regarded as being crippled by sheer envy of those that do, a key mechanism behind the evil eye and the idea of coveting. 2. This distrust is also linked to the fact that they make things. Artisans with special skills are in demand for goods of beauty. For the non-artisan cliques, these skills, it is often suggested, are the result of the artists selling their souls to devils, their gifts are diabolically inspired. 3. Following on from the above is the notion that the creation of a piece of artwork is part of an arcane and poorly understood manufacturing process that in some sense is redolent of magic. In many areas of the world–and this links in with the notion of specialist craft groups–we have this idea of an inside secret knowledge for the few and used by the few for financial gain. Within highland Ethiopia–a predominantly Christian environment although with sizeable Muslim populations–guilds or castes of artisans (be they weavers, hide workers or metal workers) are often held to possess magical powers and are known in Amharic as Buda. The notion of the Buda is actually hard to define; it has been suggested that they are not simply bearers of the evil eye, but in terms of magical complexity and social standing are rather nearer to witches (Gravel 1995, 19). On the fringes of the mainly Christian highland plateau, there is plenty of evidence of similar types of belief. Amongst the Galla pastoralist (cattle-keeping) peoples of the highland flanks, the evil eye is known to afflict herds of cattle. As cattle (as with any pastoralist society) are key guarantors of wealth and social status, such evil spells should be countered swiftly. Galla Arussi peoples make counter-charms from large frames of wood and the stretched pudenda of ritually slaughtered cattle and place them at crossroads. The symbolism of the crossroads is important; throughout Africa (and indeed globally) the crossroads are seen as a liminal point, the marking of the zones of life and death (Cavendish 1984, 304; Finneran 2002, 178). Amongst the Sidamo peoples (Hamer 1966) and those of the eastern Bench (Petros 1994), the evil eye spell is marked by demonic possession of people rather than the harming of livestock; amongst the Dorze of the Gamo highlands any minor misfortune is attributed to the Ayfe Celo or the look of an eye. It is clear that among the large ethnically and linguistically diverse population of the Ethiopian highlands and their environs, there exists a number of subtle variations of a central belief in the evil eye. It is among the highland Christian communities that much research has been conducted on the nature of evil eye belief. Ethiopian Orthodox Christianity embraces a number of idiosyncratic beliefs, not least in the adoption of customs that appear to have Judaic roots (such as dietary prohibitions). Traditional dualistic notions of good and evil are also a vital component of the daily Christian belief; the Zar, for instance, are spiteful malevolent spirits allied to the harmful and evil Saytan (ghouls), whilst the Abdar are generally benign protective nature spirits. It is in this realm of superstition, beneath a Christian veneer, that the belief of the evil eye still flourishes. The mechanisms of this belief may be structured thus. The Buda–or possessor of the evil eye–may also be known as a Tayb, which means craftsman (Reminick 1976). Artisans generally own no land and as such are generally despised by the farming and peasant groups even though they are physically, culturally and linguistically indistinguishable from their neighbours; the sole tension is based on the economic group identity rather than any other factor (Haberland 1978). This is not a rural phenomenon brought about by ideas of economic envy and distrust; even in such a thriving and rapidly modernising metropolis as the Ethiopian capital Addis Ababa certain specialist weaver groups are despised by urbanites solely because they engage in manual work (Burley 1978). So economic criteria rather than any other factors inform this snobbery, hate and distrust, and ultimately lead on in a more extreme form to the belief that such groups or castes possess the ability to cast malevolent spells via the evil eye. Both trade/craft specialisation and the ability to cast a spell through the evil eye is inherited from the father, although ultimately from the devil himself (Reminick 1974). The motivation behind casting the evil eye is seen as pure envy on the part of the Buda. The most important times for evil eye attack include: meal times, illness, pregnancy, cattle-growing and crop raising (Vecchiato 1994). It is interesting that periods associated with fecundity and multiplication should be so dangerous; it may be possible that the body is somehow weakened because most of the energy is being diverted into the promotion of growth both in the fields and in the womb, and is thus especially vulnerable to attack. When attacked–this may be accomplished by a sly gaze, or in certain cases under the guise of a despised hyena (known as dirty, evil scavengers)–bodily weakness usually follows, often allied to misfortune. In some cases the mere threat of death is sufficient (Aspen 1994); this notion accords with the idea of the Maori curse, hex or Tapu, or other cases where people have been literally scared to death almost by suggestion. In medical parlance such a condition is known as vagal inhibition and is characterised by the sudden stopping of the heart mediated by the nervous system, often leading to death. The subject believes that death is inevitable and moreover believes implicitly in the efficacy of the sorcerer. In this case the subject of the spell literally worries himself or herself to death. Conversely the Buda often possess a perverse power to instil life In the dead–rather like creating zombies–for necromancy is also a key part of the Buda’s magical arsenal. To counter the spell there are many avenues of approach. In Africa as a whole, for Instance, tradition dictates that the evil eye may be warded off by making certain hand signs, avoiding eye contact and the wearing of amulets. To some extent, this also holds true with the Ethiopian customs of counter magic, but here we find a greater reliance upon the power of the church and this power is mediated by a very strange and special figure. Within the hierarchy of the Ethiopian Church, a special role is played by the deacon, or Dabtara. These young men are not merely neophytes of the church with special responsibility for leading chants at services, but are viewed as quasi-magicians in their own right. Dabtaras are itinerant figures, often misconceived as being strange or mad, who make a living–apart from ecclesiastical activities–by providing charms and white magic (Young 1975). When a case of the Buda is reported the Dabtara will offer prayers and amulets, often fashioned from silver, a metal frequently used to counteract evil (Reminick 1975). A quite intricate and complex set of anti-magic invocations and exorcisms (Abinet) are used to cure the afflicted (Vecchiato 1993) and a variety of charms and amulets all play their part. It is commonly stressed, however, that prevention is better than cure: apart from carrying amulets and using invocations, fields are protected using scarecrows and the young will have their head shaved (headlice are thought to be the doing of the Buda). The Ethiopian conception of the evil eye embodies a number of different layers of meaning, many similar to the evil eye traditions globally, but to understand and contextualise the Ethiopian meanings, we need to consider more deeply the African framework of craft specialisation and its linked symbolism. It has been stressed that the idea of magical creation underpins the perception of artisans in Ethiopia and in the wider African context. In many cases these skills have been acquired originally from an elemental source of evil via the paternal lineage, rather like a Faustian pact. It is with the process of metal working that we find the heaviest symbolic meanings; traditionally iron itself is regarded as being a material derived from the heavens; early iron workers often used iron ore derived from meteorites, hence this analogy (Cavendish 1984, 24), and mastery over this process of transformation–almost alchemical–from ore to finished product, is akin to a magical operation. In Togo, west Africa, amongst the Bassar, the furnace is prepared with great ceremony including the giving of libations. The actual wall of the furnace incorporates plants and animal matter and these living elements are gathered by the smith whilst naked (Collett 1993). There are a number of obvious symbolic overtones here; offerings to confirm a successful outcome, the fixing of organic elements within the furnace to breathe life into it and transform it into a living structure, and nakedness as part of the preparation–akin to the Graeco-Roman magical operation–where removing clothes unimpedes and maximises the flow of energy from the body and concentrates its magical power (for example, Cavendish 1984, 235). The sexual reproductive element is highly important too. The Fipa of Tanzania decorate the actual furnace in the manner of a human bride in order to become “marriageable,” and the smelter dons red clay in the role of a Fipa bridegroom (Barndon 1996). In this sense the smelter is engaging in a magical union or marriage with the furnace to symbolically produce offspring; around Lake Victoria iron workers have embroidered the process with a rich wealth of sexual taboos and abstain from all sexual contact until the smelt is completed (Schmidt 1996). The possession of the evil eye amongst specialised craft groups can be seen as an outgrowth of the layering of symbol upon the process of creation of an artefact. In order to guarantee an aura of exclusivity, and emphasise the magical and reproductive process of smelting, the artisans invest the process with strange rites, taboos and spells in an effort to exclude the outsider and maintain a mystical air to the proceedings. Through this ritual and symbolism the artisans happily emphasise their difference from the rest of society, building up this corpus of forbidden knowledge into the rules and codifications of a loose caste group or guild. These are the social have-nots creating a new identity for themselves and a new socio-economic worth, and mainstream society, seeing this wall of exclusivity and secrecy maintained, invests these groups with an identification of distrust and isolation. These artisan groups alienate themselves, and allied to the idea that they possess a magical control over the process of making an artefact, this produces within mainstream society a sense of both fear and loathing. In Ethiopia these artisans are true outsiders, and because they are not understood and accepted into the norms of society, they are despised and feared. So there we have the core paradox; these artisans are creators and destroyers in equal measure. In the pilgrim-driven markets of the town of Aksum gold and silver crosses sell well. The craftsmen who make them earn a good enough living and it would now be rare indeed to hear them spoken of with disdain, yet there still is a remarkable underlying tension and it is hard to define. To return to my young Ethiopian colleague at the beginning of this piece, an aficionado of American R&B music, wearing a Michael Jackson T-shirt, au fait with the comings and goings of the world through television and books, easily speaking three languages and desiring to emigrate, tries to tear himself away from his deep-seated folk belief; yet, for all his pragmatism and recent first-hand experience in a bloody civil war, he cannot find it in himself to walk through that small village and confront demons that his forefathers confronted before Aksum became Christian almost two thousand years ago. This paper is based on research carried out in Ethiopia between 1995 and 1997, and in 2001. I am grateful to the Society of Antiquaries of London, British Institute in Eastern Africa and SOAS for funding. I also wish to record my gratitude to my Ethiopian friends who helped out: Solomon Berhane, Yemane Fitsumberhan and Said Mustafa. The author additionally wishes to acknowledge the financial assistance of the British Academy’s Post-Doctoral Fellowship scheme. IN1984 and 1991, in two dramatic operations, the Israeli government airlifted the community of the Beta Israel, the Jews of Ethiopia, to a new life in Israel. The passage of this community was also a dramatic passage of identity, as the Beta Israel, Jews in black Ethiopia, became blacks in Jewish Israel. The Ethiopia-to-Israel transition offers a unique opportunity to examine changing racial constructs as they are reproduced in a concrete cultural field. These racial constructs and identifications are inseparable from historic circumstance and ideology. Ever changing, they take shape and are articulated by stories told, exchanged, and developed in a dynamic and dialogic process. Racial consciousness in both groups is fashioned by way of interacting narratives: present realities are deciphered through stories from the past, while contemporary stories are continually evolving. The present work confronts the complex and multi-vocal story of the Ethiopian Jews as they encounter the Israeli host society. The stories told by members of the Beta Israel,within the intimacy afforded by in-depth interviews, are a key pointof access to deeply personal experiences not readily accessible through other means. For while the diversity of the Israeli host society has been well acknowledged, the racial subjectivity of the Beta Israel, which strongly impacts the group’s perception of the encounter, remains hidden. Moreover, the encounter between the storytellers and the researcher, a representative of the “host” society, filters and shapes the stories told. The interview dialogue is thus an arena hospitable to exploring how racial perceptions are embodied and articulated in stories in the wake of the immigration encounter. Central to the Beta Israel’s changing racial perceptions are the Ethiopian racial cosmology and hierarchies. As in many other systems of racial distinctions, skin color assumes the dimension of an entire spectrum, in which the Beta Israel did not perceive the color of their skin as black. Probing even further, beneath the skin, deeper layers become visible. The Ethiopian Jews, like their non-Jewish neighbors back in Ethiopia, were owners of “black” slaves—a fact that group members have not shared with outsiders in Israel. The slaves, known as barya, to this day constitute a separate, well-defined group. The term barya simultaneously denoted employment, status, and origin and was juxtaposed against the term chewa, which designated a free human being assumed to be educated and civilized. Even after the official abolition of slavery in Ethiopia and the prohibition of the slave trade in 1924, and even after Emperor Haile Selassie’s anti-slavery proclamation in 1931, the slaves remained a de facto part of family property and continued to be bequeathed from one generation to the next. Barya slaves were inaugurated into the Beta Israel by a conversion process rendering them barya falasha, distinct from the barya of other groups.Despite their conversion, however, their separate origin is fastidiously maintained in the collective memory. As a sub-group located both within and outside the boundaries of the Jewish group, the barya figure prominently in the Beta Israel consciousness, particularly in all that pertains to Jewish self-identity. I have documented this system of slavery as it existed among the Beta Israel in Ethiopia in previous publications. Although the Beta Israel’s slaves were converted to Judaism and immigrated with their masters to Israel, the chewa/barya hierarchy was not erased with immigration, and it continues to cast its shadow on the dynamic inherent in the encounter with “white” Israeli society. The racial constructs underlying and permeating this encounter are in constant flux, as racial boundaries are perpetually being redefined not only over time, but also in varying contexts.In the present paper, focusing on stories and story fragments selected from my ethnographic research with the Beta Israel, I listen for the actual and potential heterogeneity and nuances of these dynamic racial coordinates. Although the narrative building blocks are many and varied, stories related to racial self-definition tend to aggregate around a number of themes: origin stories, somatic characterizations, restrictions on marital pairing, passing the racial legacy onto the next generation (children), and America as the fantastic antidote. Since the significance and power of these stories can be best appreciated in the context of the complexities and dynamics of the racial discourse, the article opens with an introduction to the unique immigration of the Ethiopian Jews to Israel. The stories themselves are then presented, as the aforementioned themes take shape and reverberate in the different voices of the storytellers, including my own, as I listen and retell. The section on racial subjectivities presents a selection of story excerpts in which the racial concepts that differentiated between barya and chewa in Ethiopia are integral to the telling of personal stories. The narrative material presented in the following section examines the transformations of racial categories following immigration of the Ethiopian Jews to Israel. What emerges is an ongoing grappling, through stories, with the changing experience of the Beta Israel’s blackness. Although the voices of both chewa and barya interviewees are presented, the barya stories are prominent. The barya’s unique insider/outsider position within the Israeli Ethiopian community, with the pain and difficulty of their secret racial marginality, affords their stories unparalleled insight and sensitivity. The final section of the paper considers the multi-vocal story examined throughout the article in the wider context of post-colonial theory. The Beta Israel, once a marginal group in Christian Ethiopia, have become a highly visible community whose presence is loaded with symbolic value in Israel. The tension between religion and race, with skin color as a key metaphor, underlies the controversy as to whether the Beta Israel are “real” Jews. Prior to their immigration to Israel, the Jews of Ethiopia, also known as Falasha or Beta Israel, lived in northwestern Ethiopia in approximately 500 small villages scattered across a vast, predominantly Christian territory. Although similar in appearance to their non-Jewish Ethiopian neighbors, these Jews were an occupational as well as a religious minority. As presently expressed in the common origin myths revealed in the field research, the Beta Israel saw themselves as a distinct group, keepers of a faith that the majority of Ethiopians had forsaken for the younger and now dominant creed of Christianity. Their belief was rooted in the Old Testament, whose commandments they meticulously observed, all the while dreaming of the coming of the Messiah and a return to the legendary Jerusalem. While the religious beliefs of the Beta Israel may have sufficed for their Jewish identity in Ethiopia, they were recognized as Jews by the hegemonic Jewish establishment only in 1973. Drawing on rabbinical opinion from more than 400 years earlier, the Sephardic chief rabbi of Israel declared that the Ethiopian community was descended from the lost tribe of Dan. The ruling opened the doors of the Jewish State for the Ethiopians under the Law of Return, which defines the terms for automatic citizenship to Jewish applicants. In two major airlift operations, evocatively named Operation Moses (1984) and Operation Solomon, and in continued sporadic immigration over the years, almost the entire group emigrated from Ethiopia to Israel. The airlift of over 50,000 Ethiopian Jews to Israel, first shrouded in secrecy due to diplomatic considerations, ultimately erupted in a flood of local media coverage that tended to portray the State of Israel as an omnipotent savior. This undertaking, however, involved elaborate preparations, endless waiting, dangerous journeys on foot through the desert, hunger, and loss of life, as well as the uncertainties and daily difficulties experienced in transit camps. The Beta Israel were thus the active protagonists of the story, despite the lingering image in the Israeli and international consciousness of the big airplane, descending into nowhere to sweep the helpless refugees to safety. The hardships of immigration were compounded when a raging debate broke out regarding a decision of the Israeli religious establishment to require each member of the group to undergo conversion, due to a Jewish legal technicality. This dovetailed with a mixed reception of the group by the immigration agencies, which, although well-intended, were more focused on subsuming rather than integrating the group into modern Israel. In light of these circumstances, the reception of the group had the trappings of colonialist paternalism—a point to which I will return below—both in its guiding policy and in its concrete and intrusive intimate expressions. On a level no less fundamental to their identity, upon immigration to Israel the Ethiopian Jews found themselves turned into “blacks” in a new context, while at the same time, the Jewish hosts, themselves divided by submerged racial tensions, were recast as first-time “whites”. Significantly, the rabbinical decision, by invoking the Tribe of Dan, linked the Beta Israel to the Jewish people in a way that did not challenge the otherwise underlying presumption of common Jewish descent. The uniqueness of this group within Judaism also drew attention from the outside world. One of the first public reactions to Operation Moses referring to racial issues came from Africa: a newspaper editor in the Kenyan capital of Nairobi suggested that the airlift might put to rest the old “Zionism is racism” canard. On the other hand, Mengistu Haile Maryam, the Ethiopian ruler at the time, railed that the Zionists had “kidnapped” thousands of black Africans in order “to complete their ethnic collection.” William Safire of the New York Times countered, “For the first time in history, thousands of black people are being brought into a country not in chains but as citizens”. As these voices raged on, Ethiopian immigrants found themselves singled out in their new home as “blacks” for the first time in their history. While the experience of stigmatization as blacks was new for the Beta Israel, the phenomenon of differentiation according to shades of skin was familiar. The racist perceptions of the Beta Israel are materialized through the body and include hair, teeth, facial structure, and, most prominently, skin color. Ethiopians portray individuals according to shades that are barely perceptible, in some cases even uncategorizable, in the Israeli frame of reference. The essential colors in their system include the white foreigners (ferenji) and the range of native Ethiopian shades, which run the gamut from red (qey) to black (t’equr). Between red and black is an additional distinction for those with light brown and brown skin color (t’eyem). The Beta Israel had perceived themselves as qey ort’eyem —never as the racially inferior t’equr. “Red” and “brown” Ethiopians, including the Jews, were masters of “black” slaves. The enduring system of enslavement, in which Ethiopian Jews and their Christian and Moslem neighbors employed household slaves who lived with them in intimate subjugation, was intertwined with the Ethiopian racial hierarchy. The color hierarchies were conveyed to me in Amharic and Tigriniya within a dialogue occurring in Israel, for the most part in Hebrew, a second language for the interviewees. The difficulty in transcending not only the unavoidable terminological barriers between Hebrew and Amharic, but also the ubiquitous conceptual gaps that cannot be resolved through attempts at literal translation, gives rise to a certain number of ambiguities. Even the term “race” (Heb. gez’a) is not a shared concept that can be taken for granted, as I learned from interviewees’ frequent use of the Hebrew word for “bones” in their attempts to link the Ethiopian and Israeli understandings. This interweaving of languages, no mere technical matter, encapsulates the group’s present predicament, in which the past participates in present stories, implying that memory is in fact dialogic. Although grounded in actual historical experience, the memory of Ethiopian racial cosmology is continuously recreated through current stories and is thus ahistoric, comprising the present no less than the past. Gradient-based racial categorization, not unique to the Ethio-pian cosmology, is evident in many ethnographic examples. When channeled through color terminology, it creates the illusion that straightforward translation is possible. In the encounter between two different color systems following the immigration of the Beta Israel, the attempt to translate created a dissonance that disrupted the group’s internal color scheme. Such an ellipsis of meaning befell the term “black” in the Beta Israel’s passage to Israel, as they became “black brothers” within the Jewish composite. The preoccupation with this dissonance does not presume to identify two actual and separate systems, but aims to listen for the voice of the past within the present quest for Ethiopian Jewish identity. As the Beta Israel encountered the rhetoric, no less imagined, of the imported United States black-white binary, becoming Israel’s blacks, their own system of hierarchical race perceptions and human exploitation, so intimately bound with life in Ethiopia, was forced underground and maintained as a well-kept secret, apparently due to their sense that it would also not be well-received by the new society. As can be seen in the narrative excerpts that follow, race hierarchies persist to this day within the Ethiopian community in Israel and continue to have deleterious and far-reaching effects on Ethiopian racial identity. Between 1988-93 I conducted interviews with Ethiopian immigrants living in Israel as part of an ethno-historical study using in-depth, open, and flexible interviews. In the course of these interviews, my presence as a witnessing “other” both encouraged and inhibited the interviewees. As the past was brought to life, Ethiopian sensations—smells, sounds, images—would flood the room. Transported with them was a host of accompanying ideologies so taken for granted in the Ethiopian past, yet shockingly unfamiliar to me. With the flood of memories from Ethiopia, I felt the interviewees’ awareness of my presence alternating in and out of focus. In the moments when I felt my presence to be somewhat less obtrusive, the entire system of race perceptions that dominated the world of the Beta Israel came into relief in the stories told, as the secret of slavery was gradually revealed. For me, hearing these stories set off a process that was at once academic and personal. It was only a few years later, as I will explore below in the epilogue, that I allowed myself directly to confront the issue of racism within the Ethiopian community. Set apart within Ethiopian society, severed from humanity in general —these are the prominent themes in Beta Israel depictions of the “otherness” of the barya slaves. The strong desire of the Beta Israel to distance the barya both geographically and culturally suggests a fear of blurring the boundaries between the two groups. Thus, in the narratives relating to this group, it emerged that the ancestry of the barya was significantly obscured. Some informants hypothesized that the barya originated in southern Ethiopia, characterizing the region as a wild and uncivilized area where it was possible to “steal people during the night and sell them.” A related belief was that the barya possessed no ancestral memory. They were depicted as being completely cut off from their past, a perception reflected in such phrases as, “He doesn’t know who his mother is” or “He has nothing in his head from his parents.” Ancestral memory plays a central and valued role among the Beta Israel, and elders can recite seven or more generations of forefathers. The barya’s lack of even a minimal ancestral memory thus relegated them to a sub-human level in chewa perception. The pagan origin of the slaves further reinforced the general view of the barya as a tabula rasa, as non-human. Chewa interviewees told stories of the barya worshiping trees and stones yet described them as “having no faith.” In this context, chewa interviewees made statements such as this: “They believed in trees and stones, in nothing,” and “just maybe in some nonsense, in some tree or something.” Another chewa stated: “He doesn’t know how to pray, just says bo, bo, bo.” Thus, despite the fact that the barya in most cases understood and spoke the language of his masters, his prayer is described as inhuman, his groans and grunts like the inarticulate lowing of cattle. A system of mythological stories, rituals, and customs was conceived to perpetuate the barya’s “otherness.” Most prominent among the proof texts resorted to are the Noah stories both in the Kebra Nagast and in the Old Testament. Ham, one of Noah’s three sons, witnessed his father’s nakedness when he was drunk and, unlike his brothers Shem and Jephet, did not cover him. The black skin color of the barya thus signifies their descendency from the tribe of Ham, while the Beta Israel and their other chewa neighbors are identified with the tribe of Shem. These genealogical distinctions served over the generations as a divinely approved explanation legitimizing master-slave relations. In-group variation in appearance provides an ongoing visual reminder that the racial distinctions between the chewa and the barya are culturally constructed. Although the difference between chewa and barya are described in terms of skin color, the sight of a fair-skinned barya is at least as common as the proliferation of master-slave conjugal relations. Mixed offspring and their progeny continue to be perceived as barya as long as the collective memory, particularly deep in Ethiopia, can be perpetuated. Regardless of their actual skin color, they continue to be considered “black,” and therefore categorically different. A color-based racial frame of reference persists even today among Ethiopians in Israel. The stories told by descendants of both the master (chewa) group and the barya group reveal a continuing preoccupation with color. The most pervasive and sweeping ramification of the barya-chewa division is the prohibition against intermarriage, mentioned in one of the interviews already cited. The personal stories told by the barya reflect the pain and rage inherent in the separation between master and slave groups. These emotions are often channeled into an attempt to deny the differences between the groups, rather than into protest against racial differentiation per se. For example, one barya woman’s rendering implies that if only one of the groups were black, then a justification for exploitation might exist. This manner of telling, however, assigns the listener the task of confronting the official narrative, the narrative in which she herself still participates. Only through a complete outsider can she fully fantasize reducing the story to the realm of human invention. The acceptance of blackness as a determinant of racial otherness, of a shared color aesthetic between chewa and barya, as reflected in the narrative material presented above, indicates cultural collaboration in upholding the racial cosmology. The protest expressed in these barya accounts rejects stigmatization of the barya group without challenging the basic legitimacy of racial categories and hierarchy in Ethiopia. The frequent references to skin color are supplemented by stories referring to other indices, most specifically race-specific “bones.” It was explained that even in the case of fair skin color, the bones remain those of a barya—”black” bones. The flesh and bone, external/internal dialectic plays a vital role in establishing “black” otherness as a fixed category. Unlike bones, skin color, while retaining its distinguishing fixed categories, is subject to a mysterious metamorphosis. Another example of the contagiousness and fluidity of skin color is the popular belief of the Beta Israel that they were originally “white” like other Jewish groups, but became dark due to the Ethiopian climate. According to this belief, upon immigration, the skin of the “real” Jews would turn white again. Given that shared origin is at least as much a defining criteria for Jewish belonging as religion, the Jews who live side by side in the State of Israel, with their rich assortment of skin color and physical appearances, pose a constant visual challenge to Jewish identity. Tensions relating to this heterogeneity, perhaps due precisely to their potential to undermine the “shared origin” myth, were never explicitly expressed in racial terms. But while it was once ostensibly possible to turn a blind eye to these physical distinctions, the case of Ethiopian Jews rendered such avoidance more difficult. Although in Israel one can find ethnic tensions between Jewish groups of varying skin colors, the arrival of a distinctly “black” group allowed the term racism to enter Israeli public discourse. This concern, aimed at preventing exploitation, carried its own racial paternalism, in which the Ethiopians’ religion was viewed at the mythical level as more pure and original, and their behavior as more “demure” and “civilized” than that of the hegemonic religion and culture. On many occasions when I referred to my academic interest in the Ethiopian Jews in conversation with veteran Israelis from a variety of backgrounds, the typical response was a mixture of apology and condolence: “They’re so beautiful. I really feel sorry for them. Look what we’ve done to them. Such a quiet group [Heb. edah]. So noble. Look what we’ve put them through.” Or, in another vein, following a public lecture I delivered in a series for senior citizens, one woman commented. “I really like the Ethiopians. But please tell me, why are they so black?” A highly reactive interchange occurs, then, in relation to this unique Jewish group, as shared faith disrupts the colonial system; the idealization of religious authenticity merges with orientalist fantasies of an exotic, pure, unspoiled, and ancient Judaism preserved so long in the “wilds” of Africa. During the initial immigration period, the public in Israel attempted to place the Ethiopians on a single continuum with other Jewish groups, particularly those from Yemen and India. The attempt to identify them with the darker-skinned Jewish groups in Israel obscured the unequivocal racial otherness that potentially threatened their inclusion within the boundaries of an origin-defined Jewishness. Jokes connecting the Ethiopian immigrants with those from Yemen and India circulated, and even the immigrants themselves, seeking a physical likeness, were often heard saying, “The Yemenites aren’t really different from us, we are alike.” This shared rhetoric of a racial continuum aspired to the dismantling of categorical distinctions between black and white. Racial issues simmered over the years, but following a headline-breaking scandal concerning Ethiopian blood donations in early 1996, Israeli racial consciousness lost its guise of innocence. A major evening newspaper revealed that officials of the country’s blood bank had for years been routinely—covertly—disposing of blood donated by Ethiopians. This had been the practice since research linked the HIV virus to Africa, and in fact, among the group that waited for visas in Addis Ababa, the incidence of AIDs was relatively high. All of the blood was disposed of, even the many donations that tested negative. This revelation brought a series of confused explanations by the Ministry of Health, which sought to portray its motives in terms of the general public’s safety. Within a few days, unprecedented expressions of frustration and rage were heard from Ethiopian immigrants. Their bitterness and anguish culminated in a violent demonstration by thousands of Ethiopian Israelis and their sympathizers in front of the prime minister’s office. In their eyes, the rejection of their blood was the result of racial discrimination, and claims of protecting public health were seen as mere camouflage. The inversions imposed on the Beta Israel racial labeling take on many forms, including radical reinterpretation of traditional usages. A prominent example deals with the popular use of the Hebrew term “kushi,” used to express black otherness. Because of the biblical passage identifying kush as a son of Ham, “And the sons of Ham: Kush, Mizraim. . . . ” (Genesis 10:6), the derogatory term kushi translates directly for the Ethiopians, well versed in the Noah stories, into the “barya” sons of Ham, as seen in a number of the personal stories told. In the course of my fieldwork, I encountered overwhelming identification of Ethiopian youth with Western black singers. Posters of Michael Jackson and Bob Marley, on backgrounds of green, red, and yellow, symbolizing in their view the Ethiopian flag, are displayed in their rooms. 30 Occasionally, “Rastafarian” dreadlock hairstyles, “boom boxes,” and other symbols of identification with American blacks are seen as well. Observed on a recent New Year’s Eve at one of the reggae clubs in Tel Aviv were not only foreign workers (mainly from Ghana and Nigeria) and black American marines temporarily stationed in Israel, but also young Ethiopian Israelis. Of the vast body of racial studies, it is the focus on specific cases of racial phenomena that demonstrates that actual race relations are far more complex than any text can contain and that they are hardly unequivocal or even coherent. The immigration of the Beta Israel to the State of Israel shows to what extent power relations, as articulated in the metaphors of black and white, are negotiated by the different sides in shifting arenas. The power dynamic is projected through multiple subjectivities in the shape of intertwining, sometimes competing, origin stories. The dominant Jewish narrative based on shared belief and origin joined the Ethiopian Jews, as descendants of the lost tribe of Dan, with Jews around the world vis-à-vis a non-Jewish “other.” The immigration to Israel thus underscores the act of reconnection, the reunion of all Jews. However, this construction clashes with reality on the level of daily confrontation, in an ongoing process of racial splitting, attaching stereotypical meanings to the metaphor of skin color which, as mentioned, took on a number of paternalistic manifestations. The resultant colonialist system is at odds with that based on shared Jewish faith and origin. In other words, this is a colonialist schema with a twist. Alongside the colonial picture is the radically different image of a homecoming, not of the colonial “other” but rather the lost “brother.” The Jewish common faith combined with blatant racial otherness rattled the foundations of the traditional colonial dynamic. The racial reorganization among Ethiopians in Israel includes the reshaping of narratives and the reshaping of stories, fashioning them into political strategies oriented towards the new reality. In this vein, one finds not only Scott’s “public scripts” but also other types of strategies discussed by Scott, including “hidden transcripts” of resistance and subversion (1990). The present study suggests that dominant discourses on race and religion today in Israel—themselves in constant flux and dialogue with modern Western images—contribute to the group’s race rhetorics regarding both past and present. One striking example of the commutation of racial terms is the restructuring of racial alignments by Israeli Ethiopian youth, who retell their stories in a manner that transports the arena outwards. The attachment to African Americans circumvents the limitations of the local, without ignoring or resisting the stamp of black otherness. Due to a subjectivity that is unwilling to assume the role of “border text,” a revised alternative narrative emerges: identifying and allying with blackness in the controlling Western culture. Whereas in the first stages of immigration to Israel the chewa sought to disconnect their very bodies from the identity to which they aspired, through their magical stories of skin transformation and their identification with the Yemenite Jews, now their stories are reuniting identity and body. At this juncture where the Beta Israel acknowledge both their religious belonging and their racial difference, the seeds of a new, de-essentialized, Jewish self-definition are planted. The rapid and dramatic transformation of Ethiopian Jews’ racial subjectivity is a tale spun in a multi-vocal, dialogic context. One of the voices is that of the researcher. My discovery of the existence of internal Ethiopian racism overshadowed the hope that resides at the basis of my attraction to this group: that the Ethiopian Jewish immigration to Israel signified the possibility of a color-blind option. Listening to the voices of both chewa masters and barya slaves was a painful process. As a second-generation Israeli in a family of Holocaust survivors, facing the reverse alternative, in which the black and Jewish double victim—perceived as the controlled—is transformed in front of my eyes into the racist controller, left me with shattered fantasies and a reality that challenges the most familiar conventions of control and racist ideology. The shocking effects of this discovery may very well extend beyond my internal world, including my belonging to the larger Israeli and academic culture, once the topic enters the public realm. The traditional perception of the blacks and Jews as historical victims risks compromise by this revelation: that fellow Jews had slaves and that black Ethiopian Jews have their own “blacks.” Disclosing the existence of barya within the Ethiopian community in Israel could also stoke the flames of the already heated debate surrounding the Beta Israel’s Jewish identity. The confusing and contradictory feelings that I experienced supported the veracity of the dialogic model of racial power relations. It was with these mixed feelings and hopes that I accepted an invitation to present this material at a conference entitled “Black Responses to Enslavement, Exile, and Resettlement,” held in Israel in 1998. One of the respondents to my paper was an Israeli-Ethiopian academic. As I delivered my address, the look of mortification on her face compounded my anxiety. When her turn came to respond, she did not conceal her agitation: it had come to her as a surprise. She did not know that Israelis knew about “all this.” Regaining her composure she said, “But overall, I think it is a good thing that these issues come to the surface. Ultimately, I believe it is all for the better.” I felt revived. It was as if I had found an ally in the Ethiopian community. But then she explained: “It is a good thing, because currently, native Israelis think that all Ethiopians are black, and we are not. Once they know, they will be able to differentiate.” In trying to disentangle this web of emotion, I suddenly understood that the barya and chewa were caught in a similar trap of paradoxical victimization. The reversibility of race relations and the rapid transformations from racializing—black on black (chewa/barya)—to racialized—white on black (black Ethiopians in Israel)—and again to racializing—black on white (se’ado or bula)—reveal that there are no certain terms in the never-ending stories of self-definition. The public meeting of voices at the conference was a vivid demonstration of the ongoing process of constant mutual narrative re-interpretation, in which Ethiopian and Israeli race perceptions are refracted within one another, both in the sense of fracturing and of replication. The research takes shape in a hall of mirrors, of reflected stories, and the division between researcher and researched is all but obliterated by the impassioned human response evoked on both sides in parallel fashion. Hagar Salamon is a senior lecturer in the Department of Jewish and Comparative Folklore, and a senior research fellow at the Harry S. Truman Research Institute for the Advancement of Peace, both at The Hebrew University of Jerusalem, Israel. Her most recent book is The Hyena People: Ethiopian Jews in Christian Ethiopia (University of California Press). Composing the acknowledgments for this article, as well as for other publications on this sensitive topic, is particularly poignant. Many people from the various groups that comprise the Jewish Ethiopian community in Israel, people unrivaled in their honesty and courage, come to mind. These people shared their memories, fond and painful alike. It is my hope that my research efforts will mark the beginning of a new chapter in the successful integration of the entire group in the Promised Land. I would like to thank Galit Hasan-Rokem, Harvey Goldberg, Steve Kaplan, Rachel Elior, Tamar Katriel, Eyal Ben-Ari, and Jessica Bonn for commenting on earlier drafts. A [End Page 23] former version of this article was presented in a conference entitled “More than Cool Reason: Black Responses to Enslavement, Exile and Resettlement,” held at Haifa University in 1998. I would like to thank the conference participants who contributed their comments and support. The article is the result of a study sponsored by the Harry S. Truman Research Institute for the Advancement of Peace, at the Hebrew University of Jerusalem, and the Memorial Foundation for Jewish Culture. The event at the Kennedy Center this week for Senator Ted Kennedy reminded me of the time that Bobby Kennedy came to Ethiopia back in the 60s. As I have written elsewhere, here is a little known story about Bobby Kennedy and the time he met up with PCVs in Asmara, Eritrea. We go back to the summer of ‘66. Bobby had been to South Africa where he was a huge success with college students, and given his famous “Ripple of Hope Speech” that contains one of the most quoted paragraph in political speech making. The speech was written by Richard Goodwin and Adam Walinsky and delivered on June 6, 1966 in Cape Town. Traveling north, Bobby and his wife, Ethel, a few aides, and several press people from the U.S. arrived in Addis Ababa, and here Kennedy met with American officials, plus PCVs, on the lawn of the American Embassy, and early the next morning traveled to Asmara, Eritrea where the Ethopian Airlines plane touched down and there was another reception for Kennedy at the airport. Invited to the airport were the ‘officials’ of the U.S. government stationed in Asmara [at the time we had an important military station in Asmara.] Meeting the senator were the heads of various in-country missions stationed in Asmara. Also invited to the early breakfast meeting/reception was the late George Blackmon, the APCD in Asmara, and a 1962-64 Ethiopian PCV. When George arrived at the small Asmara airport he found a hand-full of PCVs clustred together outside of the building. They had biked out of town before teaching their morning classes in hopes of meeting Kennedy. A number of them were from New York, Kennedy’s home senate state. They told George that the guards wouldn’t let them inside to meet Kennedy. They weren’t on any official list of Americans. George, God bless him, told them to wait. When Blackmon got inside he joined the reception line to shake hands with Kennedy. George was a big, likeable guy from Texas, over 6-6, outgoing and engaging. At the time he must have been 25 years old. When he shakes hands with Bobby, he tells Kennedy that a group of PCVs are outside the building and aren’t allowed inside to meet him. He tells Kennedy that they had biked out to see him and he asks Bobby if he might “just step outside for a moment” to say hello to the Volunteers. So, George leads Bobby out of the reception, out of the airport building, out onto the lawn where Bobby sits down on the grass with the Volunteers and talks to them about being Peace Corps Volunteers in Ethiopia while they wait for the plane to refuel. Kennedy leaves the ‘official Americans’ inside the building. Let me tell you: the U.S. Embassy folks were not happy! And that was Bobby Kennedy. It’s another example of what the Kennedys thought of the Peace Corps. OUAGADOUGOU, (Reuters) - A film set in Ethiopia about a bloodthirsty regime under which political dissidents and village children alike were ruthlessly killed has won best movie award at Africa’s top film festival. “Teza,” a feature by award-winning director Haile Gerima set during Mengistu Haile Mariam’s 1974-1991 rule, won the top prize late on Saturday at this year’s 40th pan-African FESPACO film festival in Burkina Faso. Judges praised the film, 14 years in the making, for its strength, depth and poetry conveying the dashed hopes of a returning intellectual elite. Stunning village vistas and shoulder-dancing amid ululations in bars capture an expressive, vital Ethiopian culture. “The message of the film is peace,” Selome Gerima, associate producer of the film and sister of the United States-based, Ethiopian-born director, told Reuters while beaming and clutching her Etalon d’Or de Yennenga (Golden Stallion of ennenga), Africa’s equivalent of an Oscar. The plot follows a series of horrific experiences endured by hero Anberber, who trains as a medical research scientist in Europe. On his return to Ethiopia full of hope and eager to contribute to his country, he and his friends are violently and cruelly rejected at home and again back in Germany. 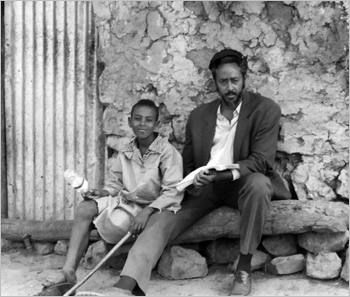 Shot in the Gerimas’ hometown of Gondar in northwest Ethiopia, the village cast was drawn from locals during three months of filming, many of whom had experienced the brutalities of the regime firsthand. “Some had experienced the Red Terror. One mother started crying bitterly because it reminded her of when they took her daughter,” Selome Gerima told Reuters during the festival, referring to the violent purges that marked Mengistu’s rule. Several entries among this year’s competition have raised a critical voice and urged change on the continent.In the South African film “Nothing But The Truth,” which won second prize, director and lead actor John Kani plays a librarian denied promotion, and who believes post-apartheid freedom’s dividends have not been realised. In real life Kani’s brother was shot dead in a church by police while reading a poem at the grave of a nine-year old girl killed during an anti-apartheid riot. Since Teza premiered in Ethiopia at the start of 2009, Gerima says cinema halls showing the film, which has also won awards at the Venice Film Festival, are still sold out two months later. On Saturday night, the winning film was screened in cinema halls across Burkina Faso’s hot, dusty capital Ouagadougou, where more than 300 films have shown in the past week.